Minestrone (Italian for "the big soup", the one with many ingredients) is the name for a variety of thick Italian soups made with vegetables, often with the addition of pasta or rice. Common ingredients include beans, onions, celery, carrots, stock, and tomatoes. 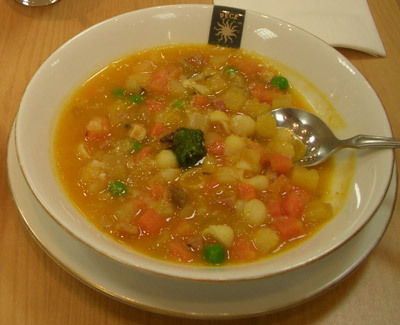 Due to its unique origins and the absence of a fixed recipe, minestrone is not particularly similar across Italy: it varies depending on traditional cooking times, ingredients, and season. Minestrone ranges from a thick and dense texture with very boiled-down vegetables, to a more brothy soup with large quantities of diced and lightly cooked vegetables that may include meats. Minestrone alla Genovese is a variant typical of Liguria, which contains greater use of herbs, including pesto.